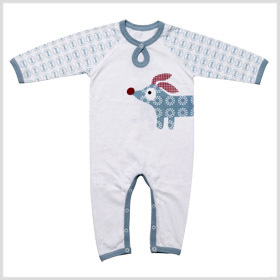 I came across this gorgeous baby sleepsuit by Franck & Fischer and I felt I had to share it with you. After having a little girl and being told that it's not as fun buying for boys, I've looked around and I have to say that it is harder to get excited about boys baby clothes, because the girls stuff always looks far prettier, but there are some really cute things out there for boys if you look hard enough. Franck & Fischer also have some fab baby toys - and a few owl related items too and I love owls.....Check them out.